You might not be able to serve up a malt, but a little paint and planning can get you the 1950s look for less. If you love classic kitchens but can’t afford a renovation, there are still plenty of ways to add retro appeal. Start by digging up a few old photos with design details you want to recreate at home. 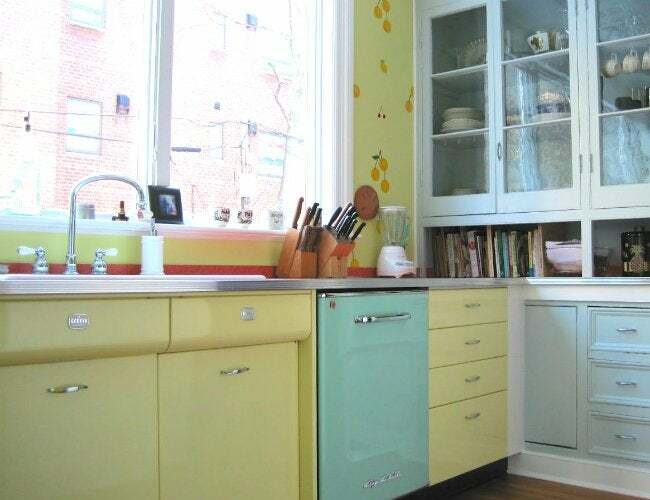 A lemon yellow, turquoise, or bubblegum pink accent wall will take your kitchen back in time in an afternoon. For cabinets, go with a vintage-inspired pastel on the outside or remove the doors and paint the back panel to create eye-catching open shelving. When everything is dry, finish the mini-makeover with chrome drawer pulls and knobs. And while you’re at it, swap out a builder-grade light fixture with a few pendant lights to brighten up your counter or island. Experienced DIY-ers can build their own cozy breakfast nook with hinged benches. The compartment below the seat is the perfect place for seldom-used cookware. If you’re not that handy, a 50’s-style dinette set will give your family a place to gather. Another option? Look into retro-inspired brands that are cashing in on the new-again trend with candy-colored appliances and range hoods. Finally, put those vintage kitchen linens and dishes you’ve collected to use. They’ve stood the test of time for a reason!